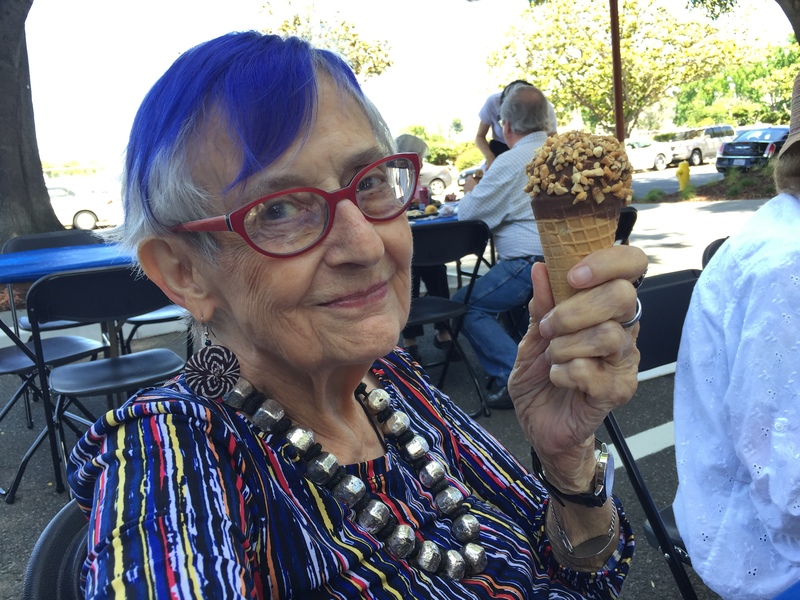 My mother, Eleanor Creekmore Dickinson, passed away peacefully at the age of 86, on 25 February 2017 in San Jose, California, surrounded by family. 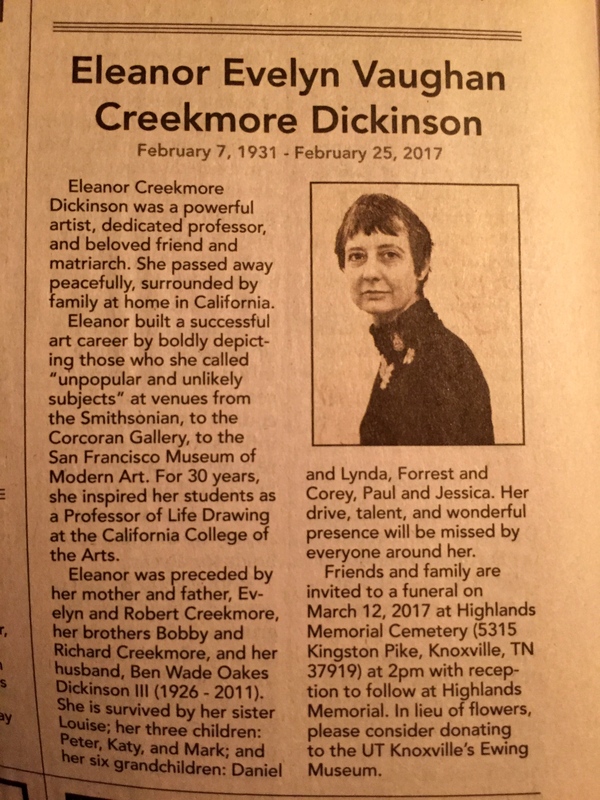 Eleanor Creekmore Dickinson was a remarkable American artist who was actively creating, teaching, and exhibiting fine art for over 75 years. ​ ​She touched the lives of so many who were inspired by her and her work. Her personal motto was: “You Will Never Get it All Done”. My mother will be buried with her husband, my father, Wade Dickinson in Knoxville, Tennessee, this ​weekend. I know I will see some of you there. However, many will not able to attend. We will also have a San Francisco Bay Area Memorial Service to which you are also invited – RSVP if you can join us, or if you have questions. I​n lieu of flowers, please consider donating to the University of Tennessee – Knoxville’s Ewing Museum. Eleanor Creekmore Dickinson was a powerful artist, dedicated professor, and beloved friend and matriarch. She passed away peacefully, surrounded by family at home in California on February 25, 2017, just after her 86th birthday. Eleanor built a successful art career on solo shows that boldly depicted those who she called “unpopular and unlikely subjects.” She reveled in transgressing the assumptions of medium, using lucite, black velvet, video, and sky-writing as fine art materials. For all her high-flying passions, Eleanor was deeply rooted. She returned to her birthplace in Knoxville, Tennessee, nearly every year of her life, and her decades-long work documenting Pentecostal revivals throughout the region is housed at the Smithsonian. Her love and effort helped ensure that the Elkmont cabins where she spent her girlhood summers were designated a National Historic District. Eleanor’s art and life were a study in chiaroscuro, of light bringing shape to the darkness. She was a former Daughter of the Confederacy who marched for civil rights. She lived in San Francisco’s posh Pacific Heights but worked at her warehouse studio in Oakland. She striped her hair black-and-white with electric blue or pink streak to shock socialites in San Francisco but she dyed it brown again to ease her way with the worshippers she sang with at the revivals. In her early 20s, she married a West Point man who worked in the oil and arms businesses but the largest work of art in her living room was a piece she had drawn showing the torture of an Iraqi man by US soldiers stationed at Abu Ghraib prison. She’d drawn that ghastly scene on a canvas of black velvet, using the light to show the man’s pained form crucified. It was a medium she’d picked-up from those revival worshippers. She used her gifts to cast light on the darkest parts of being alive, like the 40 watt light bulbs that brought light to revival tents in the Knoxville night. 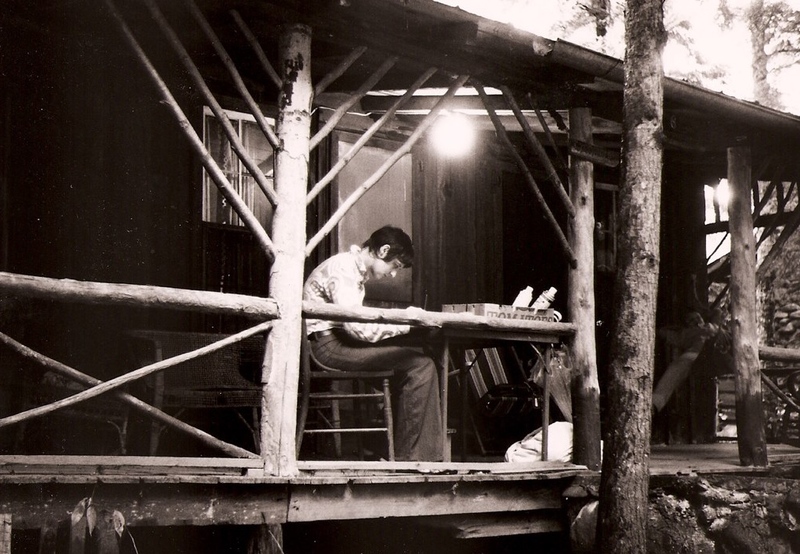 Eleanor liked light, music, crowds, noise, and trouble — causing it; getting out of it; drawing it. She loved to pick a gleeful fight. She reveled in protest. She founded organizations, served on boards, and supported groups that she believed would better the lives of women, artists, people of color, and anyone she saw being mistreated. Her sense of justice was immense and uncompromising. She did everything she could to fix our broken world. But the most vital part of her was always dedicated to art. The quiet hours of drawing, drafting and redrafting, a cooling cup of coffee always at hand on a wobbly wooden antique stool, heaps of white gum eraser filling her lap and getting on the cats. She kept cats her whole life, along with iguanas and rabbits, tarantulas and frogs. Eleanor included her animals in whatever she was working on at the time — if they sat still long enough. Drawing was her life and she drew life out of every medium she put her hand to. 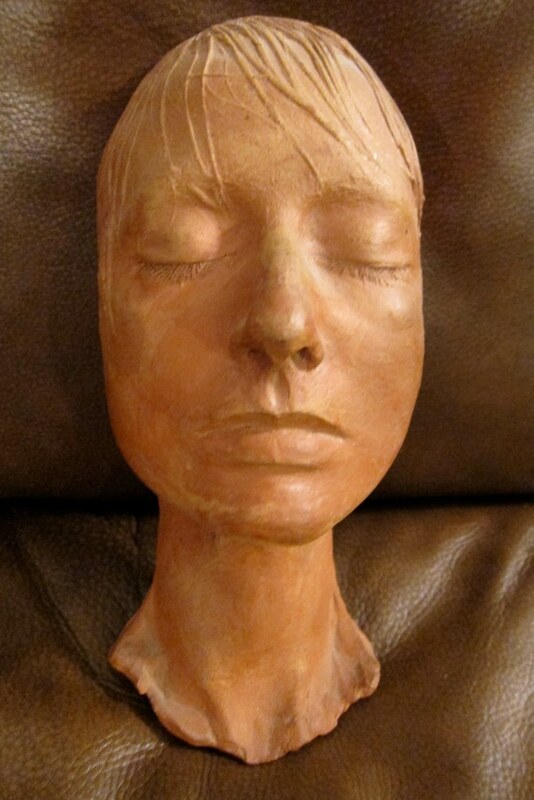 Eleanor’s work was shown most recently in the exhibits “Artists and Their Models” at the Smithsonian Archives in 2014, and “Old Lovers” that same year at the Peninsula Museum of Art. She was recognized nationally in her lifetime with public collections and archives hosted by the Smithsonian’s Archive of American Art, the Library of Congress’s Archive of Folk Culture, the Corcoran Gallery of Art, the San Francisco Museum of Modern Art, the Fine Arts Museums of San Francisco, the Tennessee State Museum, the Oakland Museum, and the University of Tennessee Libraries, among many others. She received a Lifetime Service Award from California Lawyers for the Arts (2016), the Lifetime Achievement Award from Women’s Caucus for Art (2003), and was named an Emerita Professor of Drawing by California College of the Arts after serving as a professor there for 30 years. Throughout her career, she was recognized by being named an Artist-in-Residence at the Fine Arts Museum of San Francisco (2000), Arkansas State University (1993), University of Alaska (1991), and University of Tennessee (1969). She was honored with the Women’s Caucus for Art President’s Award (1995), a Distinguished Service Award from National League of American Pen Women (1989), the Distinguished Alumni Award from the San Francisco Art Institute (1984), a Distinguished Alumni Citation from her alma mater the National Cathedral School (1978), awards from the San Francisco Arts Commission (1973 and 1968), and finally an Award of Merit from the City of San Francisco (1968). She co-authored and illustrated several books, including That Old Time Religion (1975) and Revival! (1974) with her late childhood friend and Knoxvillian writer Barbara Benziger. The above list is a brief selection of her recognitions and her impact and is just one measure of a life vibrantly lived. Those who knew and loved Eleanor miss her terribly. We miss her creativity, her activism, her sharp wit; most of all, we miss her friendship. Go with God. Eleanor was preceded by her mother and father, Evelyn and Robert E. Creekmore, her brothers Bobby and Richard Creekmore, and her husband, Ben Wade Oakes Dickinson III (1926-2011). She is survived by her sister Louise Creekmore Senatore of Knoxville, her three children, Peter Dickinson of La Crescenta, CA, Katy Dickinson of San Jose, and Dr. Mark Dickinson of Boston, and her six grandchildren, Daniel and Lynda, Forrest and Corey, Paul and Jessica. She will be missed by everyone around her. Kudo to another southern rebel who used her art to get it right.